Although pretty much every man has worn a suit in his life, not every man has worn real tailoring. Unlike mass-produced two-pieces (which do the job for certain budgets and requirements) a bespoke or made-to-measure example crafted by a tailor is practically a piece of art for your body, with highly skilled hands – often several generations deep – painstakingly measuring, cutting and sewing fabric into form-fitting body armour. Just as not all suits are created equal, neither are all tailors; leading to this list of very best in the world, from homegrown talent on the hallowed Savile Row to skilled stitchers much further afield. No address in British menswear carries as much cachet as No. 1 Savile Row. 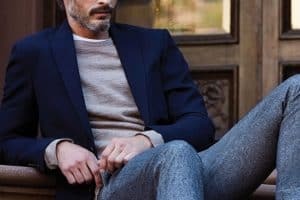 It was purchased by then Hawkes, the preeminent name in military tailoring, in 1913, and the brand has since become a force in the fashion world as well. That its client list includes Bill Clinton and Michael Jackson hints at its balance of tradition and innovation, particularly under former creative director Jason Basmajian, who modernised the firm by combining its history with cutting-edge design and an expanded offering. So you can now get the same quality in a peacoat as the suit you wear under it. With a history that dates back to 1809, Huntsman is one of the most storied names on Savile Row. In its 200-year history it’s dressed most members of the royal family as well as Hollywood royalty – Gregory Peck ordered over 160 Huntsman suits during their 50-year relationship. As you might expect, it’s also one of the Row’s most traditional brands; most cutters are still trained up from apprentice level. They’re particularly skilled at the brand’s signature cut: a high armhole and strong chest with a long, flared-out skirt. The Golden Mile of Tailoring saw two booms in innovation in the 20th century. The first came in the 1960s when tailors like Tommy Nutter began dressing the likes of the Rolling Stones. The second was 30 years later when a wave of anti-establishment menswear mavericks led by Richard James began to think about suits as clothes for play as well as work. Cuts were slimmer, colours brighter and fabrics chosen for how well they caught the eye. Today, the brand shows at London Fashion Week Men’s and has a thriving ready-to-wear line to complement its bespoke service. The one downside of traditional tailors is that all that heritage can dull their fashion sense. Not so with Thom Sweeney, the brand launched by Luke Sweeney and Thom Whiddett in 2006. The pair met in the workshop of Timothy Everest, who trained at Nutters and forged the New Bespoke movement alongside Richard James, and they decided to take a similarly modern approach to men’s suits. The pair’s signature is more relaxed than the Savile Row standard; nearer an Italian jacket, with minimal canvassing and a soft shoulder. English tailoring at its most laidback. Not every great British tailor resides on Savile Row. Edward Sexton currently operates out of an intimate shop in West London’s Knightsbridge area, although he cut his teeth on menswear’s most famous street. He learnt the trade making military uniforms, then set up shop with Tommy Nutter in the 1960s, where he dressed style icons of the time including Mick Jagger and Sir Paul McCartney, all the while defining the big-lapelled, wide-trousered aesthetic of the 1970s. Today, Sexton makes classic suits by appointment only, as well as offering a line of luxury accessories. Neapolitan tailoring is traditionally light on padding but big on colour. Kiton nails the former but made its name by eschewing the latter. Its suits are elegant and restrained, the idea being that when something is produced using the world’s finest fabrics – all crafted by the brand’s in-house mill – and made completely by hand by some of the world’s most talented tailors (45 work for 25 hours on each suit), it doesn’t have to be canary yellow to catch the eye. Each of Caruso’s suits is designed with one man in mind: the ‘Good Italian’, immortalised by Hemingway in his travel book. He is a man who travels well, who lives life with fastidiousness, taste and curiosity. All of which finds expression in the brand’s tailoring, from the handsewn buttonholes (each of which takes 15 minutes to craft) to its innovative cloths. Such is owner Umberto Angeloni’s own curiosity that five per cent of the brand’s resources goes into R&D, with 32 staff dedicated to creating 4,000 new prototypes annually. Which is why a Caruso suit looks like nothing other than a Caruso suit. When Gennaro Rubinacci opened his first premises, in 1932, he called it the ‘London House’, because his style drew so heavily on English dandyism. In the 80 years since, however, Rubinacci has done more to define Neapolitan tailoring than almost any other brand – the soft shoulders, high armhole and cinched waist that are synonymous with the city are house signatures. It also boasts an unrivalled archive of more than 60,000m of vintage fabric, resulting in a suit that has already lasted a lifetime, and will continue to do so. This 87-year-old brand is about as traditional as Neapolitan tailoring gets. Cesare Attolini’s suits are the definition of the city’s style: soft shoulders, wide lapels and, if you want it, punchy fabrics (the brand’s not afraid of a gingham jacket or chalk-stripe). But that tradition extends beyond the styling. Each suit takes around eight weeks to make, handcrafted in Italy from exclusive fabrics, even if you have your measurements taken in one of its international stores. Isaia was launched in 1920 as a cloth merchants, servicing Naples’ growing army of tailors. It wasn’t until 1957, when the brand moved to a nearby village where half the residents were high-end tailors, that Isaia began turning its own fabrics into some of Italy’s finest suits. It has a more international feel than many Neapolitan tailors – its suits are cut slim from innovative materials like waterproof wool – and it has an even more youthful subline, Eidos, where expertly cut unstructured blazers rub up alongside skater chinos and selvedge denim. When Donald Trump gave his inauguration speech in a Brooks Brothers coat and shirt, he continued a tradition that stretched back to the founding of the Republic. Since 1818, the tailor has dressed 40 presidents, including Lincoln (who died in a Brooks Brothers coat), Kennedy and Obama. Widely recognised as the oldest men’s clothier in the United States, it’s also best known for introducing the button-down collar in 1896 when John E. Brooks, the grandson of founder Henry Sands Brooks, spotted them on English polo players. Not a tailor per se, but a home-from-home for the world’s best. The Armoury solves New York’s dearth of homegrown bespoke by flying in the finest craftsmen from around the world, as well as stocking ready-to-wear from brands like Caruso and Japan’s Ring Jacket. If you can’t make the trunk shows, the Armoury’s in-house tailors are so intimate with their partners that they can fit you for made-to-measure, which is then produced back in Italy, London or Tokyo, before being flown back to your wardrobe in New York. New York has never had much in the way of a bespoke suiting culture; its residents have always been so in thrall to Savile Row that its tailors tend to fly over and do fittings, leaving little business for homegrown talent. But Martin Greenfield bucks that trend. His story epitomises the American dream: a Ukrainian Jew, he learned to sew in Auschwitz and, the only member of his family to survive the Holocaust, left for America when the camp was liberated. His skills immediately shone; only a few years later, he was making clothes for Dwight Eisenhower, who he’d met when his troops were the first to enter the concentration camp. He’s since dressed everyone from Paul Newman to the cast of Boardwalk Empire in suits that epitomise American craftsmanship. Brothers Kirk and Derrick Miller opened their bespoke tailor in 2010, inspired by a grandfather who’d run a haberdashers that suited up South Dakotan frontiersman. Everything they sell is US-made, though their style comes from further afield; a mix of Italian and English tailoring that makes for something with body, yet still relaxed. They’re pragmatic, too – the house signature is a single-button closure, designed to avoid any confusion over precisely how many a man should do up. Until 1997 and the transfer of Hong Kong’s sovereignty back to China, Raja Fashions was the go-to tailor for British expats. But when the diplomatic corps decamped back to Britain, they took their business with them. So Raja Daswani, the founder’s son, went on the road. You’re now as likely to find the brand’s representatives in the finer hotels of New York, London and Sydney, as you are its 60-year-old store on the mainland in Kowloon. Tony Blair was a fan when he was in power, and commissioned his shirts and suits from Raja. That’s not just testament to their quality; with suits starting from just £250, it’s the kind of bespoke that even a Labour PM couldn’t be pilloried for in the press. Chinese tailor Ascot Chang made his name as a master shirtmaker, crafting garments first for Chinese businessmen, and later their counterparts in the US. In the 1980s, after 30 years in business, the brand added bespoke suits to the mix, with a cut that nods to classic British tailoring but with a sportier update – think shorter hems and softer shoulders. But frankly, you get whatever you like: its fitters prefer to fashion something that suits the client, not the other way around. Like many Far Eastern tailors, WW Chan’s approach is a mix of British and Italian influences, with soft but slightly roped shoulders, a full chest and a slim, figure-flattering silhouette. Unlike most of its neighbours, WW Chan makes all its garments in-house, from one of the widest fabric selections outside Italy, by tailors who rival the best of Naples and Savile Row. Being a Hong Kong brand, this quality comes at an incredible price; though WW Chan is steep for Hong Kong, a fully bespoke suit is still a third of what it would cost back home. John Cutler is the fourth master tailor in his family and now runs the business his great-grandfather, Joseph Cutler, founded in 1882. A tailor with more than half a century’s experience, John learnt his trade at his father’s side (also named Joseph), via a brief detour to train with the masters at Savile Row. And that experience is apparent in the house’s English-influenced style, with strong shoulders and chest and a full skirt. Cutler still cuts every garment himself and his full bespoke service is made entirely by hand, with not a single stitch done by machine. Patrick Johnson’s nine-year-old tailoring brand marries Italian style with Australian quirkiness, with each of its products designed in Sydney then produced by hand in the brand’s workshop in Tuscany. The brand specialises in made-to-measure – although it has a small ready-to-wear collection, sold through Mr Porter – and its style is as light as suiting gets without becoming a cardigan. Perfect for hot Australian climes, summer weddings or your office when your colleagues won’t leave the thermostat alone. That Paris’ best tailor was founded in Rome gives some idea of Italy’s lock-up on fine suits. Cousins Lorenzo and Massimo Cifonelli are the fourth generation to run the shop on the Rue Marbeuf, where they continue to cut the English-meets-Italian style developed by their grandfather, Arturo, after his studies in London. A Cifonelli suit is distinguished by its shoulder, roped and shifted slightly in towards the chest, which means its suits have structure but are still incredibly easy to wear. It’s Italian technique, with a touch of je ne sais quoi. Brunello Cucinelli isn’t just a good tailor; he’s a good tailor. A fifth of the brand’s profits go to charity, and he pays his workers 20 per cent more than the industry average. The brand’s clothes are sumptuous, crafted from some of the finest cashmere on earth, but styled by the man himself in a way that belies their quality; the archetypal Cucinelli jacket looks good as a suit, but often even better worn as a separate with jeans. Tailor Noriyuki Ueki apprenticed at Tokyo’s Ring Jacket before spending four years learning his craft in Naples. His style is understandably indebted to the Italians, with soft shoulders and big lapels, but with his own signature details. The buttons on a Sartoria Ciccio sit lower on the jacket, which pulls the lapels deeper and lengthens the body, while a lack of vents gratifies its maker’s love of clean lines. Like all Japanese artisans, his suits aren’t cheap (prices start at around 580,000 yen [£3,900]) but that outlay buys you the kind of craftsmanship and attention to detail that Japan does better than anywhere else on earth.